Best Webfoot Forward » Arkansas liberalism? I added a state legislatures partisanship layer to my election map, and also modified a metric which shows kind of how liberal an area is. For every governor, US senator, or US congressman in a district that is a Democrat, I added one. For every legislator who is a Republican, I subtracted one. Now, with the new data, I also add one point for each state legislative chamber that is controlled by Democrats, and subtract one for each that is controlled by Republicans. 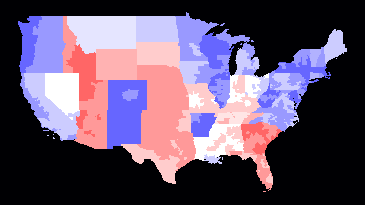 Some things are not surprising: the northeast is very blue; Idaho and Utah are very red. However, I don’t get Arkansas. I wouldn’t have thought that it would be culturally very different from its neighbours, yet most of the state has the maximum value of +6. Is this all due to Clinton? Did he build a really strong Democratic Party operation in Arkansas? Or did he throw a bunch of money towards Arkansas, for which they are still grateful? Can anyone familiar with Arkansas shed any light on this? The comment on Arkansas is interesting. I wonder if it would be fair to say that the great political policy shift of 1968 affected them less?